other committee meetings, including the library advisory committee, audit and risk management committee and other advisory committees and working groups. Due to the Kings Square Renewal Project, council and standing committee meetings will be temporarily held at the North Fremantle Community Hall. Meetings commence at 6.00pm. 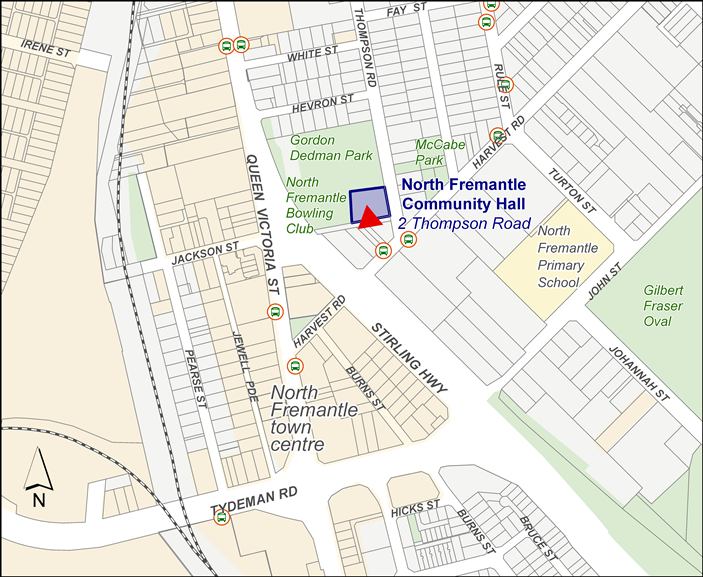 North Fremantle Community Hall is located at 2 Thompson Road, North Fremantle (see map). Access to overflow parking is off Hevron Street, North Fremantle. The library advisory committee meeting is held at 5.30 pm on the second Wednesday of February, May, August and November and will also be held at the North Fremantle Community Hall. The audit and risk management committee will be closed to the public while the administration offices are located in the temporary office at Fremantle Oval, 70 Parry Street Fremantle. Click here to access the meeting schedule. The finance, policy, operations and legislation committee has delegated authority to make decisions on a range of matters including policy, advertising strategies and plans, transport, parking, traffic management, tenders, council property and more. The planning committee has delegated authority to make decisions on matters relating to planning, including planning applications and responses to the State Administrative Tribunal and the Western Australian Planning Commission. The strategic planning and transport committee meets to consider and make recommendations to the council in relation to the following strategic land use, planning, urban design and transportation matters. Audit committees are established by the local government in accordance with the section 7.1A of the Local Government Act 1995 to provide an independent oversight of the City's financial systems, financial reporting and audit and risk management responsibilities. Audit and Risk Management Committee meetings will not be open to the public while the administration is situated temporarily at Fremantle Oval, however agendas and minutes will be made available. The library advisory committee is formed pursuant to the City of Fremantle Library Advisory Committee Local Law to advise the councils of the City of Fremantle and the Town of East Fremantle regarding the management and control of Fremantle Library. The committee is appointed after each local government election and is comprised of members of the City of Fremantle Council and the Town of East Fremantle Council, and members of the library who are not elected members of each council. Meetings are held quarterly on the second Wednesday of February, May, August and November, at 5.30 pm at the North Fremantle Community Hall. Meetings are open to the public. Agendas are published on the City’s website by 5.00 pm on the Friday before the meeting. A limited number of agendas are available at each meeting. Alternatively, a copy of the agenda can be viewed at the library, located at Fremantle Oval, 70 Parry Street, 8 William Street, Fremantle. Time is set aside during council and committee meetings for public question time. All members of the public who wish to ask a question or make a statement will be given an opportunity to do so. submit your question or provide detail of your statement before 12 noon on the day of the meeting (these questions and statements may be given priority). register at the venue (at least ten minutes before the meetings starts) and the presiding member will call you forward to address the meeting. A registration form is available outside the meeting venue between 5.30 pm and 5.50 pm on the day of the meeting. raise your hand when the presiding member asks if there are any questions and or statements from the public. Once you have asked your question or made your statement, you will not be able to enter into the discussion or debate the issue with members. Once your item has been dealt with, you may remain for the rest of the meeting or leave the venue at any time. If you would like to register to speak in reference to an item at a planning committee meeting, contact the planning committee minute secretary on 08 9432 9805 or planning@fremantle.wa.gov.au before close of business the day of the meeting, or register outside the meeting venue up to ten minutes before the meeting is due to commence. Questions must relate to an item on the agenda or the ordinary business or function of the City of Fremantle. Special deputations and petitions may also be presented at council and committee meetings. Click here for more information on participating at council and committee meetings. Decisions and recommendations to council made by the council or committee are recorded in the minutes of the meeting but not the council or committee's general discussion on each item. If you speak during public question time, a summary of your question or statement, including your name and suburb will be recorded in the minutes of the meeting. All council and committee meetings are recorded and copies may be available to purchase in accordance with City of Fremantle policy Recordings and transcripts of council and standing committee meetings. Under the Local Government Act 1995 the City of Fremantle is required to publish unconfirmed minutes within ten business days following the council meeting and five business days following the committee meetings. The planning committee, finance, policy, operations and legislation committee and the strategic planning and transport committee have delegation to make certain decisions on behalf of council. Click here for information on the delegations to committees. Occasionally, members of the public may be requested by the presiding member to temporarily leave a committee or council meeting to allow for discussion of a confidential item.